Switch things up a bit and skip the green salad. 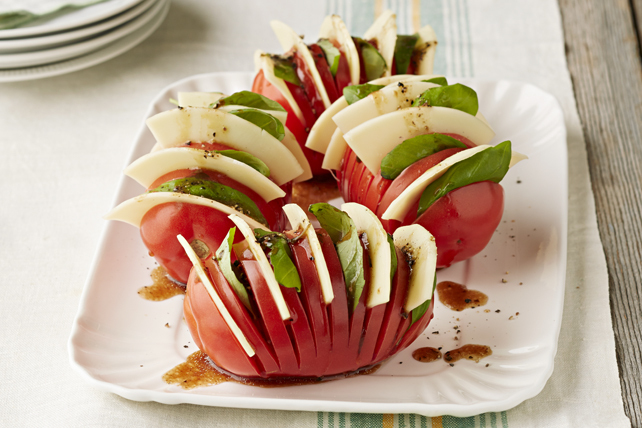 These Hasselback Caprese Tomatoes make a delectable summerfresh side dish! Cut thin lengthwise slice off one side of each tomato; discard. Place 1 tomato, cut side down on cutting board. Starting at top of tomato, make 10 vertical cuts into tomato, being careful to not cut all the way through to bottom of tomato. Repeat with remaining tomatoes. Place tomatoes on serving plate. Insert 5 each cheese and basil pieces alternately between cuts in each tomato. Drizzle with dressing; sprinkle with pepper. Prepare using Cracker Barrel Havarti Cheese Slices. Place each prepared tomato, cut side down, between 2 wooden spoons, then use the spoons as a guide to help prevent you from cutting all the way through to bottom of tomato.